If you have received a notice of violation, you must perform repairs within 75 days. if not, DOT may perform the work or hire a contractor to perform the work and the Department of Finance (DOF) will bill the property owner. You may be able to take advantage of DOT's expedited sidewalk repair program. With an expedited repair, DOT fixes the defect and the City sends you a bill for the cost of the work. No further inspection is required. If your sidewalk problems are caused by tree roots, your property may be eligible for repair by the Department of Parks and Recreation (DPR) under their Tree and Sidewalks program. DOT does not charge property owners for repairs to tree-damaged sidewalk flags. DOT will only install concrete sidewalks, if your sidewalk is made of granite, slate, brick, or some other non-concrete material and you want to replace it with the same material you must make arrangements to repair it privately. If your sidewalk is constructed with concrete, DOT may make repairs or replacement with concrete. If you do the work privately, you must obtain a permit from the Landmarks Preservation Commission. For more information, dial 311 and request a Landmark Building Alteration Permit. The City will not repair sidewalks over vaults or other structure. The property owner is responsible for making the repairs. Fixing a sidewalk over a vault may require considerable structural work. If the defective portion of your sidewalk is over a vault, you must fix it privately. Once you have chosen a contractor, you can call 311 to find out whether there are any consumer complaints pending against them. Once you have hired a contractor, make sure they obtain all necessary permits before beginning the work. Call 311 and request a Sidewalk Construction Permit. Currently, the price of a permit to repair your sidewalk is $70 for every 300 linear feet of sidewalk for any one property. The price of the permit covers the administrative cost of the permit as well as the cost of sending out an inspector to perform a dismissal inspection. Please see the back of the Notice of Violation for more information. Note that a sidewalk permit does not extend the 75 day period to start repairs. 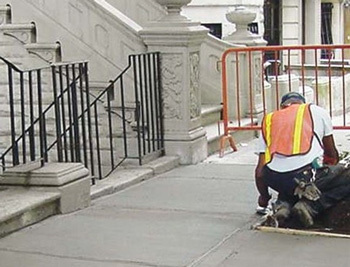 After the work is completed, call 311 and request a Sidewalk Violation Dismissal. An inspector will come to verify that the work has been satisfactorily completed. Once all the repairs have been completed, call 311 are request a dismissal inspection. When calling, have all of the following information ready: the permit number, the property address, the block and lot number, and the violation number. Make sure that the entire sidewalk is visible before the inspection. If sidewalk defects aren't repaired within 75 days after a Notice of Violation is issued, DOT may perform the sidewalk repair or hire a contractor to perform the work if a sidewalk defect. You will receive a formal notification before the City's contractor arrives to perform the work. A consultant or representative of the City will photograph your sidewalk to document the condition before construction, and will mark the flags that must be replaced and then continue on to perform the work required. After all defects have been repaired, DOT will notify the County Clerk to remove the violation from your property. The Department of Finance will then bill property owner for the work. To estimate cost the cost of the repair, multiply the estimated square footage shown on the preliminary inspection report by the cost per square foot shown on the letter that came with the Notice of Violation. If any of the area to be repaired is a driveway, use the 7″ concrete cost for that area, otherwise use the cost of 4″ concrete. The final bill may reflect additional repairs required to bring the sidewalk up to DOT standard specifications. If any flag on your sketch is marked with an "X", the flag may qualify for DOT to replace it at no charge to you. A final decision regarding the replacement of such flag will be made by a Department of Design and Construction engineer at the time of construction. The property owner has 90 days to pay the bill before interest is added. After 90 days, interest will accrue and a monetary lien will be placed against the property. The contractor's work is guaranteed for 18 months from the end of the contract period. To request a payment plan for a sidewalk repair being billed to you, you may do so at a Finance Business Center. For more information, dial 311 and request a Sidewalk Repair Payment Plan. The 75 days begin when the violation is received by the property owner as indicated on the certified mail receipt. In cases where the violation notice is not delivered by mail, the violation will be posted on the property, and the posting date is the start of the 75 days. The 75 day period is the same throughout the year. A contractor should be scheduled to begin repairs as soon as the weather permits. If the City performs repairs and you are not satisfied with the quality of the work, the amount of work that was done or the accuracy of the measurements used to calculate my bill, you should make an appeal with the Department of Design and Construction (DDC). The first step is to write to the DDC borough office. This information may be found on the back of your Notice of Violation. You should specifically state the nature of the disagreement. All appeals to the DDC borough construction offices must be in writing. Telephone calls and personal visits will not be considered appeals. If you are not satisfied with the response, your next step is to file a Notice of Claim with the Office of the Comptroller. If the Comptroller's Office does not find in your favor, you may file a Petition of Appeal at the New York State Supreme Court, Small Claims Assessment Review Part. The petition forms will be provided to you upon request, at no cost, by the County Clerk's office. There is a $30 filing fee. To be eligible, you must allege that at least thirty days have passed since the Notice of Claim was presented to the Office of the Comptroller and that they did not make a determination or they denied the claim. Please note that all of the above procedures must be followed in the exact order outlined above. If the City contractor damages a sidewalk through its own negligence, the contractor must make the repairs at no cost.. Please contact the DDC borough office. For more information, dial 311 and ask for DDC Project Inquiries and Complaints. Claims for damage allegedly done by the City should be filed with the Office of the Comptroller within 90 days of the damage. For more information, dial 311 and ask to File a Claim Against the City.